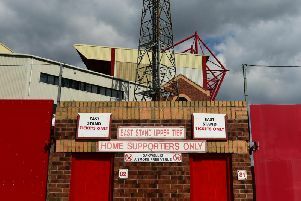 Cian Bolger might be missing some teeth, Kyle Dempsey picked up a knock and Ched Evans was struggling for fitness as Fleetwood Town drew 2-2 with Rochdale. It was a bad tempered affair at Highbury at times with Dempsey marking his 100th game for the club by playing the final minutes through the pain barrier. “I just think it is an impact injury,” said Town head coach Joey Barton. But the duo were not the only ones in the wars. Paddy Madden had a blood injury and had to strip off on the side of the pitch while Town’s other goalscorer, Evans, also came off as he was struggling. Barton will assess his squad’s fitness this week ahead of the clash at Scunthorpe United on Wednesday. With Evans missing the midweek cup win at Crewe through injury, Town did not want to risk further aggravating it. Barton said: “He (Evans) has been struggling this week, he did not train in the earlier part of this week. “He missed the Crewe game because of it, he was struggling at half-time; it was nice for him to get his goal. Going into Wednesday’s Scunthorpe clash Barton wants his men to learn their lessons from this draw and improve their game management. Ian Henderson netted from the penalty spot for the visitors and then popped up with a last gasp equaliser. Barton said: “It is football, it does feel like we have lost the game, certainly given as dominant as we were for large periods of the game. “But you have got to go and do that, see the game out. We get 2-1 up and then have chances to put the game way beyond them. “If you do not take that you leave sides with an opportunity to hurt you. “Credit to Rochdale because they kept going right to the end and got that equaliser. “It will probably feel like a win for them. “On the balance of play it is disappointing for us but you have got to pick yourself up very quickly in this league because the games come thick and fast. “We have got a tough game at Scunthorpe during the week so a test of anybody is how you respond to adversity. “So far this season with out dealings with this group they have been first class. “We had a disappointing performance at our last home game.